One of the new Community Shape Scripts on Tinkercad is a very nice Voronoi diagram maker by Brandon Cole (including the code!). 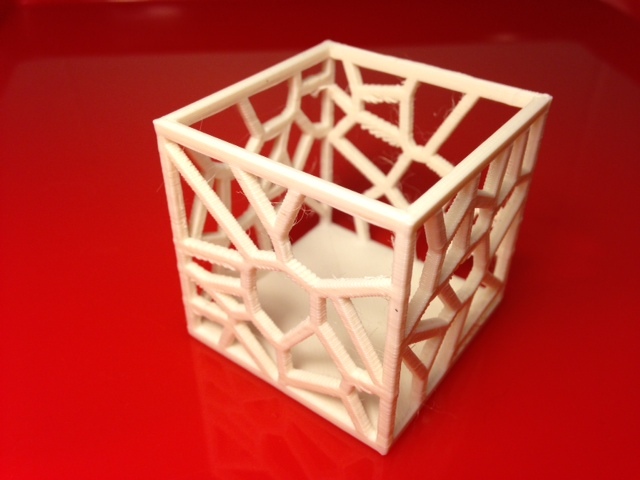 As a sort of random test of what sorts of angles we can get away with when printing without supports, here is a trinkets box with Voronoi sides made from Cole's shape script. Settings: Standard MakerWare "low" setting with no raft and no supports, on blue painter's tape. Print time 48 minutes. Technical notes: The Replicator 2 did a good job printing without supports on all but the most extreme overhangs, and an especially nice job of bridging along the top border. The model is a good sample set of what the printer can and cannot handle well. Obviously if you want to make a nice copy of this model then you should use some supports. The edge thickness is 2mm everywhere and fairly sturdy.